“Aldrig kommer att ge dig upp!” Once you get a taste of Squeez Bacon®, you’ll know exactly what he meant. A few years after WWII ended, a young man working in a small restaurant in Sweden developed a new way to process bacon. By precooking it and blending it in a special way, he was able to make a fully cooked 100% bacon paste that could be squeezed from a tube. Knowing he had discovered something paradigm-shifting, young Vilhelm Lillefläsk quickly went into business. That, dear friends, is when Squeez Bacon® was born. And this delicious delectable from Sweden has finally been brought over to the USA – now with American Flavor! We’ve been working for months now with Vilhelm Lillefläsk (yes, he still runs the company!) 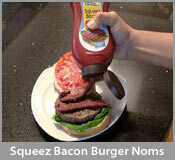 to bring Squeez Bacon® here, and boy are we proud. Why? 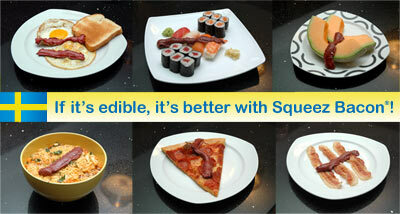 Because Squeez Bacon® is simply the tastiest bacon food product ever made. Did you know that it’s rumored ABBA met while eating Squeez Bacon® sandwiches? And even IKEA founder Ingvar Kamprad (we’ve heard) never travels without a case! He loves it on his American style meatballs. Ojojoj! This entry was posted in Family, OffBeat and tagged food. Bookmark the permalink.